The iconic combination of that word under the image of Andre the Giant is discussed in Kelton Reid’s piece, “How an Unknown Street Artist Used Content Marketing to Build a Global Brand.” The artist is Shepard Fairey. Reid identifies Fairey’s rise to the top as not just the result of the high-profile media he produced four years ago, but Fairey’s ongoing process of media creation and output. This, says Reid, established a strong brand and loyal followers. In other words, Fairey followed the essentials of content marketing. 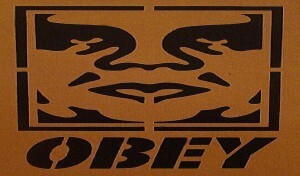 Reid points out one parallel to blogging: “[B]y sharing his public art for free over many years he created something viral — the brand Obey Giant — and his audience demanded more. After a couple years, they were the ones spreading the message.” Free content that provides value results in dedicated fans. If you build a dedicated, loyal platform and then have something to sell, it sells. Fairey used content marketing fundamentals to build a platform at the intersection of fine art, street art, and later, politics. There are lessons in his work for businesses that are seeking direction amidst disruptive technological, economic, and social trends affecting journalism, media, and marketing. One work in particular encapsulates these trends. Fairey is best known for his 2008 Obama “Hope” poster. The “Hope” poster was produced in support of Obama’s presidential campaign and captured the optimism surrounding it. It quickly became the unofficial, and perhaps strongest, visual branding of the campaign’s marketing efforts. This campaign image has spawned countless rip-offs and parodies, and some may argue even influenced aspects of the current campaign’s retro look and feel. The poster proceeded to create a firestorm of copyright controversy when it was revealed that its origins began as an AP photo. This is a timely example of emerging copyright flexibility. This trend is best represented by the growing adoption of Creative Commons licensing, which allows remixing of digital work, with or without attribution, depending on the license. There is a parallel between this single image and blogging. Just as a blog post itself is limited in reach or influence, an ongoing collection of focused blog posts — as in a Newsblog — can build and influence a community’s understanding of, or relationship to, an idea, product, or service. A blog may never reach the cultural zenith of Fairey’s image but it can wield tremendous power when compared to competitor content online. “That’s the most powerful thing that art can do,” says Gan Golan, the co-author and illustrator of Don’t Let the Republican Drive the Bus! — a political satire based on a children’s book. “[Art is] not to convince you that someone else is powerful, but to convince you that you yourself are powerful. And that’s something the Shepard Fairey poster did,” he adds. The original Fairey print now hangs in the National Portrait Gallery. No similarly iconic image has risen from either party in the 2012 election campaign. 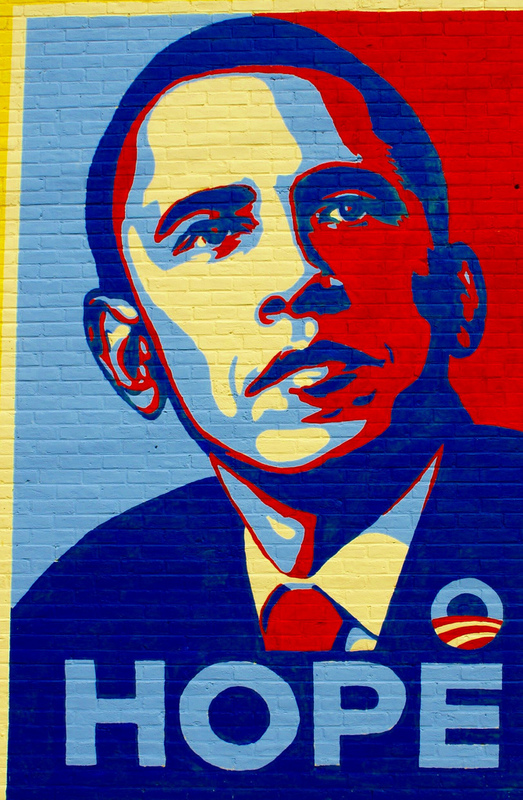 “Sure, I think most people in the art community are going to vote for Obama, but I think that enthusiasm — that inspiration — has waned in the past three and half years,” says New York University communications professor Stephen Duncombe. Perhaps it is because we’re still trying to make sense of all the change — yes, change — that has, and still is, happening in so many industries?